Metalsmith Kristin Diener, MFA, almost glows when she talks about grouping objects into her piece. A staggering amount (literally hours upon hours) of work goes into crafting handmade metal chain links. Building Kristin’s incredible art requires layering color, forming bezel cups, prepping and cutting the back pieces, not to mention the sanding, polishing and finishing. As Kristin described the joy of morphing components into completion, without really planning out the end result, the thought of how the process compares to marketing flashed before me. Stay with me if you will. 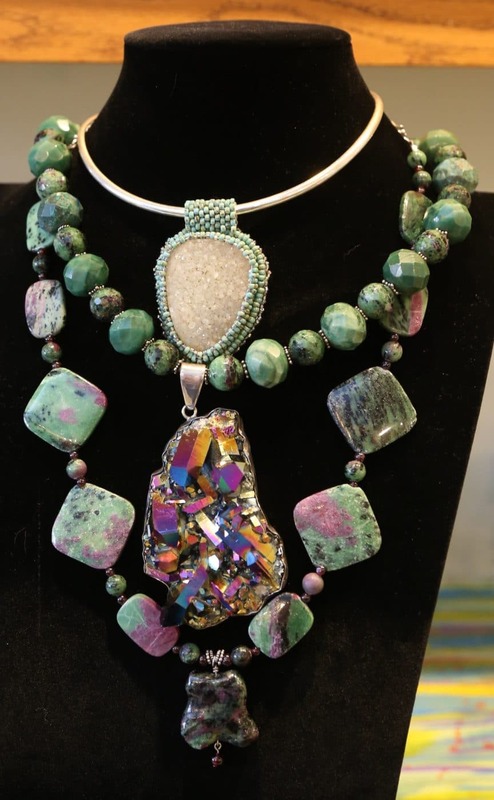 “The metal talks to me,” Kristin expressed as she discussed her process with members of the Bead Society of New Mexico. As artists, most of us love spontaneity. More than a few of us let imaginations dictate how a piece will present itself. We then leap to the conclusion that what passes for marketing will work itself out. Our excuse for marketing on the fly is that we’re simply being spontaneous. The analogy of morphing components to completion fails to grasp the years of preparation that give a metalsmith the flexibility required to create a masterpiece. Kristin, for example, knows how foil placed under a particular stone will reflect color. Even though her design may not be sketched in complete detail, it benefits from her practice of making numerous other components. Like a metalsmith, an artist’s marketing, your marketing, begins with strategy. Some things you simply must do. What is it that you must plan and execute consistently to sell your art? I believe you already know the elements your strategic plan must contain. Whoa! Does that surprise you? What is the main thing you want to accomplish? One thing. I’m suggesting your strategic marketing plan is like a railroad track. If you keep your eye on the main thing on the road ahead, your engine will stay on track. I work with a coach and author who wants a new website. The major components that go into building that website, including researching software, developing a list of comparison sites, detailing the navigation for her potential visitors, and developing content that meets her goals. These are components of the track which will accelerate her end goal. In a short, focused brainstorming session, we began by applying questions to different scenarios. In each instance, we listed a number of steps and possible outcomes. In a few minutes we detailed a three-month timeline that will result in a finished project. Another author I work with wants more visibility in her community. She said she didn’t know where to begin. Yet, when we used different questions about her specific outcome, she realized a speaking program would help her attract long term clients. She could then leverage the power of groups in the process of building to her goal. We usually know what we need to do. Taking action is the difficult part, yet it’s a mindset, a strategic mindset. As someone once said, it’s 80% psychology, 20% mechanics. “Success is only 20% skill,” says Tony Robbins — “here’s what makes up the rest …an unbelievable level of resilience inside you, and I tell everybody, the chokehold on the growth of your business is always the leader, it’s always your psychology and your skills —80% psychology, 20% skills,” Robbins said. Marketing is the mechanics. Your strategic plan lays out the mindset you’ll need to succeed. It’s always easier and faster to see solutions with the practiced help of an outsider. I love working with artists who have decided to get strategic and get results. I’m currently scheduling mentorships with new artists and business artists who have the courage to take the next step. Will we talk? Privacy statement: We pledge not to loan, rent, sell, or otherwise abuse your trust.